How should historians speak truth to power – and why does it matter? Why is five hundred years better than five months or five years as a planning horizon? And why is history – especially long-term history – so essential to understanding the multiple pasts which gave rise to our conflicted present? 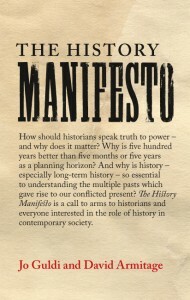 The History Manifesto is a call to arms to historians and everyone interested in the role of history in contemporary society. Leading historians David Armitage and Jo Guldi identify a recent shift back to longer-term narratives, following many decades of increasing specialization, which they argue is vital for the future of historical scholarship and how it is communicated. This provocative and thoughtful book makes an important intervention in the debate about the role of history and the humanities in a digital age. It will provoke discussion among policymakers, activists and entrepreneurs as well as ordinary listeners, viewers, readers, students and teachers. Open Access publication available to read online or download as a pdf. Freie Universität Berlin invites applications for its undergraduate FU-BEST (Berlin European Studies) program for Spring 2015 and beyond. It also extends an invitation to any institutions that may wish to join our large community of program partners. Students from a wide range of U.S. institutions have successfully participated in this growing program, which has been positively evaluated by the Forum on Education Abroad. Please see http://www.fu-berlin.de/en/sites/fubest/about/partner/index.html for details. Based on the U.S. academic calendar, FU-BEST offers a strong intensive German language program, covering all levels, as well as an exciting menu of almost 30 content courses taught mostly in English but also in part in German. There is no language prerequisite for participation in this program, but all participants are obligated to enroll on-site in German language training at their particular level. The content courses cover topics from a variety of disciplines, ranging from political science, history, philosophy, and sociology to music history, architecture, film studies, marketing/management, environmental studies, sociology, and art history. Every semester features a week-long off-site excursion (in the case of Spring 2015, the participant group will be divided in two and will travel to Strasbourg/Paris and London, respectively), as well as many local field-trips, cultural events, and related opportunities. Participants are housed in homestays or single-occupancy apartments, but may also opt out of these choices if they set up their own housing sufficiently in advance of the program. The cost of this program is, by current standards in higher education, quite affordable in our view, enabling a growing number of students to participate. See http://www.fu-berlin.de/en/sites/fubest/fees/index.html for details. Starting with the Spring 2015 semester, the program plans to add two new courses, on film music and on women’s studies (both in transatlantic perspective), to its already broad curriculum. For a listing of courses, please follow this link:http://www.fu-berlin.de/en/sites/fubest/prog/courses/index.html. The application deadline for participation in the Spring 2015 semester is October 15, and April 1 for the Fall 2015 semester.Please note that we can now also accept application files via e-mail in PDF-format, as long as the files are complete in all respects and contain all necessary signatures on the various pages. Students may apply directly to FU-BEST (after approval at their home institution) or via their home college/university (especially where an institutional partnership exists). For full details on courses as well as other features of the program and application materials, please visit www.fubest.org and click on the many links to all the information and documents (including course syllabi). This resource includes essays on British social history collected between 1937 and 1972 during a project called the Mass Observation. The archives also include photographs, file reports, diaries, day surveys and links to other sites. Describes in detail aspects of British life in the 1940s and 1950s. Topics covered include attitudes to war, the role of the United Nations, youth crime, radio listening, famous people, and household budgeting. Trial ends Sept. 19, 2014.